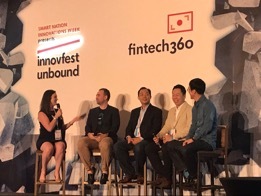 The Singapore Fintech Association and unbound co-organised the fintech360 satellite event in the innovfest unbound 2017, to bring together the fintech ecosystem, build relationships, share knowledge, and create business opportunities. The multi-format fintech360 brought coverage across the brave new world of money, featuring deep dives into key areas of disruption and spotlights for the most exciting innovations, covering a wide spectrum of topics ranging from the rise of Asian FinTech to globalising FinTech. All SFA members were given 2 complimentary tickets to the event worth $900.